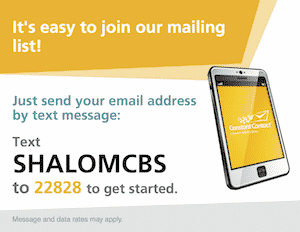 Use this form to submit Bima or weekly Digest announcements to Congregation Beth Shalom. If you are submitting to both the digest and bima announcements, please create separate entries in the form below. Digest announcements have a 650 character limit while bima announcements have a 350 character limit. Digest announcements are limited to 650 characters. Bima announcements are limited to 350 characters. Would you like to include your announcement in the newsletter?